Without a map, it’s hard to know how long a trip will take. You can get lost, and you can forget where you’re heading. For instance, I don’t know how to travel from my house in Austin to the world’s largest ball of twine in Cawker City, Kansas. But thanks to the power of maps and technology, I am able to tell you that it only takes 10.5 hours, and the route is pretty straightforward. The World’s Largest Ball of Twine in Cawker City, Kansas. Just as traditional roadmaps show the proper route to get from point A to point B, marketing and product roadmaps help show the path you must take from where your business is to where you want your business to be. These long-term plans provide a zoomed-out view of what needs to be accomplished over the next days, months, and years providing guidance and clarity in what can be uncharted waters for many companies. If you’re a B2B marketer, our new B2B lead generation map infographic can help you better understand your marketing funnel, identify opportunities for improvement, and think long-term about the growth of your lead generation business. It provides a zoomed out view of the entire marketing ecosystem so you can see how pieces of your marketing plan fit together, how a customer will travel through your funnel, and how you ultimately can get from where you are to where want your business to be. Want to see how to use the infographic? Keep reading. As an entrepreneur, marketer, or team member tasked with growth, you have a lot on your plate — it’s a constant balance between wins that can help your company today and long-term vision that builds a great company of tomorrow. Long-term thinking is not something most people are born with — but the best entrepreneurs are often the ones that have the uncanny talent of thinking years ahead. For instance, consider Jeff Bezos. Over the past two decades, he built Amazon from a small online bookstore to the world’s largest retailer by constantly thinking about the long-term vision of his business. His long-term focus has introduced revolutionary products such as Alexa and AWS, and investors continue to trust him in reaching groundbreaking goals year after year. With the hustle and bustle of modern work, it’s often hard to sit back and think holistically about how marketing integrates with your long-term business goals. But when you do, you start moving your company towards long-term success. So, how do you build a long-term outlook into your role? I’m a new hire on the marketing team at Proof — and one of the first things I aimed to do when I joined our team was to figure out the long-term ecosystem of our marketing strategy. Yes, it’d be easy to jump into my job and start writing articles, trying to rank for keywords, and drive traffic that I think will be valuable to us. But that lacks long-term vision. It’s more valuable for me, my team, and our company if I enter my role with an understanding of what our current marketing flow looks like, how the system works, and where I can best use my skills to introduce new customers into our funnel. Then I can better move forward with focus. What are the main takeaways of the infographic? Are there obvious gaps in my strategy? What large traffic sources are we not currently utilizing? Why? Are we utilizing EVERY major social network and search engine? To pull back in my own experience, I was able to look at this section to see where we currently spent the majority of our marketing budget and time. I then looked at where we distributed content to date. By studying that data, I was able to identify areas where I could add value and provide new articles on our blog that could deliver relevant high-converting traffic to new audiences over the next several months. On the right side of the infographic, you see two other sources of traffic: off-site content and referral sites. Off-site content such as press releases and infographics provide an opportunity to get placements at touchpoints on the web by creating interest and demand for your business or product. This content can be valuable for many types of companies as viewers will see that content on a referral site, and then funnel to your site! What sites do our customers read? Do I have contacts in my network that will publish something we create? How do we amplify eyeballs on an internal article? Are there gaps on a particular subject that I can create an awesome piece of content to fill? Off-site content is a keystone of Content Marketing and PR for many B2B companies (including Proof). For an early stage company, we’ve made great progress on PR, but we haven’t focused on many of the other elements of off-site content. Over the next year, I plan to make off-site content a key element of our Content Marketing strategy. On the second row of the infographic are eight smaller hexagons that represent channels that you likely already monitor in your attribution model. As a marketer, you will find this row important in monitoring and reporting on your sources of traffic. Skilled marketers keep an eye on their funnels here, and constantly use data to optimize towards low CPAs and efficient customer acquisition. Why do we do a process this way? 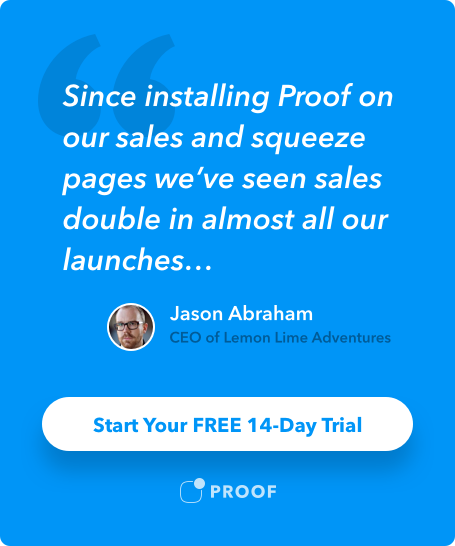 What can we do at this point in the funnel to increase conversion? Can we create an asset (whitepaper, demo, infographic, etc) to make this section more efficient? The grey hexagons on the bottom row demonstrate the process that will occur once a lead form is submitted or a customer calls your business. 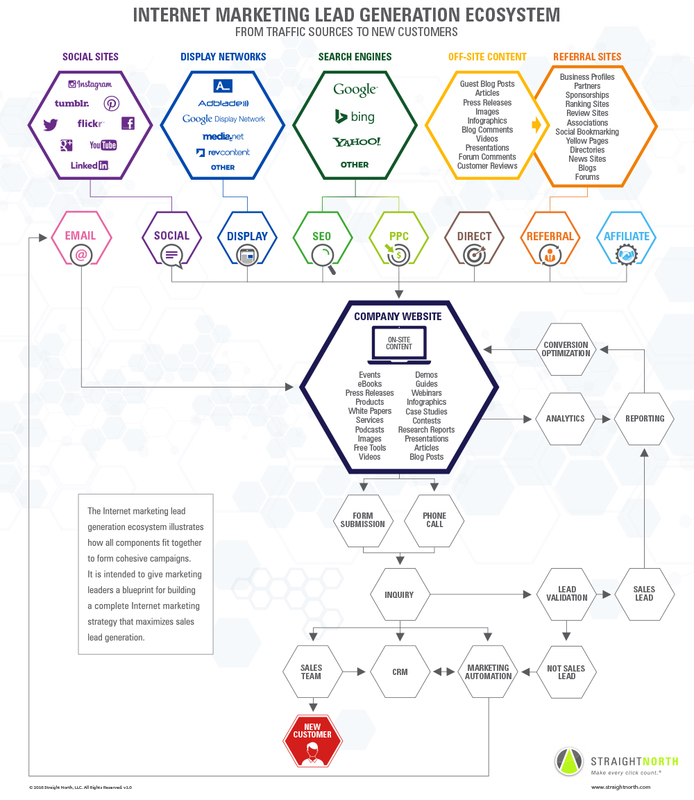 Most of these hexagons are internal processes (CRM, Marketing Analytics, Reporting, etc.) and require close collaboration between marketing, sales, and product. This is a section of our funnel that I am still ramping up on, but I plan to master this section of the funnel over the next month. To best utilize this map in your business, I suggest printing out the B2B lead generation infographic. Then, take a pen to the printout and start writing and circling everything you do in your funnel currently. You’ll quickly see new opportunities and may even identify unnecessary steps in your current funnel! Once you start understanding the B2B lead generation ecosystem, you’re on your way to being a monster marketer. You’ll be long-term focused and better able to identify, quantify, and measure how the levers you pull affect customer acquisition, retention, and ultimately the long-term trajectory of your business. Creating a map might seem like overkill when you could spend your time on something that has more immediate value, but I implore you to consider mastering the B2B lead generation ecosystem — it’ll be worth it in the long-run. Did you find this article helpful? Want more infographic content on our site? Leave a comment below!